We have improved, we think, on the classic Easter Sunday Sticky Toffee Pudding recipe with our own rather delicious Sticky Spiced Rum Cake. 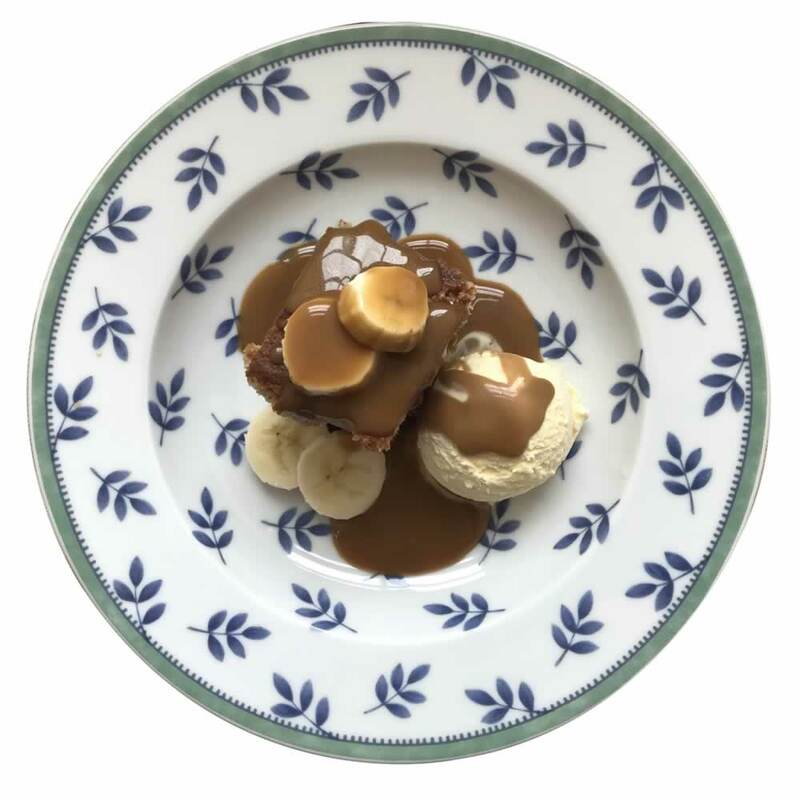 The cake element comprises of a Banana Loaf which is then covered with a moreish Spiced Rum Sauce, made using our popular Spiced Rum Liqueur 20%. The simple Spiced Rum Sauce could of course be used to enhance other cake and pudding recipes. The possibilities are limited only by your own creativity! Preheat the oven to 180C. Grease and dust with flour an 8” square ovenproof dish. Mix together the melted butter and the sugar and then add the eggs, mashed banana, lemon juice and vanilla extract. Stir in the remaining dry ingredients until just incorporated without over mixing. Bake in the prepared dish for approx 35 mins, until a skewer comes out clean. Combine the cream, butter and sugar over a medium heat until the sugar has dissolved. Keep stirring frequently. Add the Spiced Rum Liqueur once the sugar has dissolved and simmer until the sauce has reduced to a syrupy consistency. Stir every now and then to stop it catching. Once the banana sponge is cooked spoon 1/3 cup toffee sauce over the cake and return it to the oven until the sauce is bubbling vigorously (about 6 minutes). Cool the cake for at least 30 minutes and then cut into 9 squares or 12 rectangles.Serve at room temperature or slightly warm with sliced bananas on top and warm sauce poured over. (Editors note; Mr Demijohn is permitted to add dairy ice-cream to his serving!). 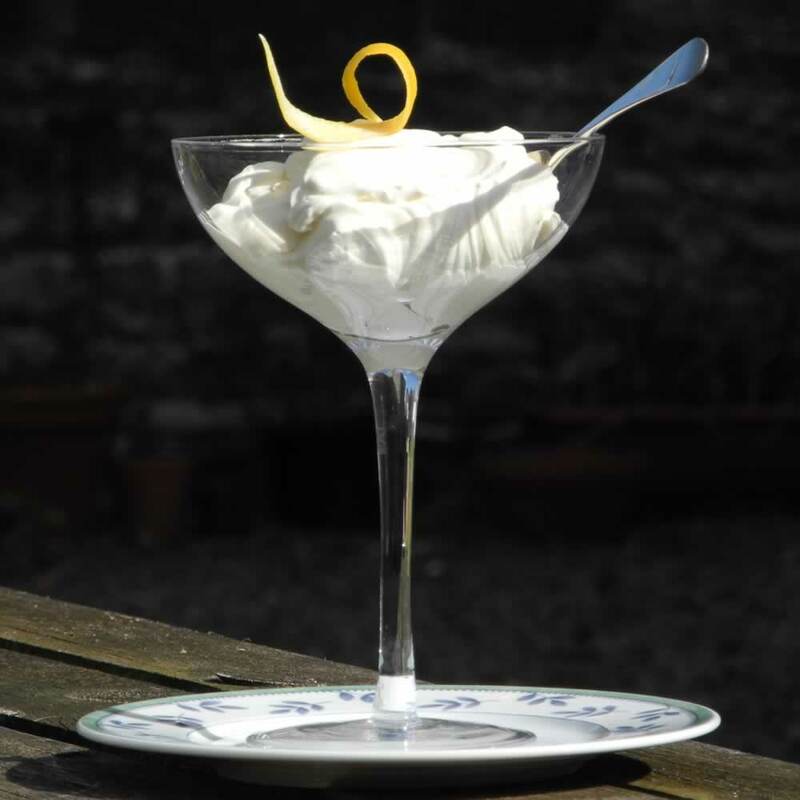 If you are looking for a deliciously creamy pudding that is simple and quick to make, our Mead and Lemon Syllabub recipe is the perfect answer. The sweet honey taste of our Traditional Mead, combined with zest of lemon and whipped cream is irresistible. A dinner party favourite for sure! Gently simmer the lemon zest and its juice, Traditional Mead and sugar in a pan to dissolve sugar and release the oils from the lemon. Remove from heat and strain the syrup into a cool bowl, then add the double cream. Whisk until thick and then spoon into a Champagne coupe glass and chill for about an hour. Garnish with a twist of lemon peel. Working at Demijohn HQ is not too insufferable when it consists of baking a Chocolate Rum Cake made with our dark Chocolate Rum Liqueur 29.5%. And I don't think the family were too miserable about it either. I adapted this recipe very slightly from enthusiastic food blogger Sara Jayne Jones, who wrote passionately about our Chocolate Rum Liqueur 29.5% in her blog. It's a great way to make an indulgent treat for an adult chocoholic and enjoy the strong cacao flavours of our dark Chocolate Rum Liqueur. Our Chocolate Rum Cake is made in 3 easy steps, starting with the sponge, then filling and finally the icing. Grease the cake tins and line the bases with parchment. Break the chocolate into pieces and together with the cubed butter melt it in a microwave, stirring occasionally. Separate the eggs, then whisk the egg yolks and sugar in a large bowl until creamy. Add the rum and cooled chocolate mixture to the yolks and mix well. Gently fold in the sieved flour. Whisk the egg whites in a separate bowl until stiff then lightly fold into the mixture. Distribute cake mixture between the tins and level gently. Bake for 40-45 minutes or when a skewer comes out of the cake cleanly. Save some raspberries back for decorating the cake. Mash the remaining raspberries with a fork. Mix the cream, Chocolate Rum Liqueur and icing sugar on high speed until soft peaks form in the mixture. Gently fold the mashed raspberries in with a spatula. Break the chocolate into squares and place into a bowl. Heat the cream in a saucepan over a medium heat, bringing it to the boil very carefully. Allow the ganache to cool a little before topping the cake with it and decorating with the remaining raspberries. And now finally put it altogether and enjoy with the family ...... delicious! I had a nervously experimental attempt at making these the other day, really in preparation for a family tea party during the Easter holidays. Much to my surprise they turned out like a very edible little rock cake, and a potential Easter gift for all the family to enjoy. In fact, since the children now tell me that they don't eat figs I've almost scoffed the lot! Beat together the sugar and butter and then slowly add the mead. Add the chopped dried figs, then mix in the flour sifted with baking powder. Let the dough rest for about ten minutes. Preheat oven to 180°C and line a baking sheet with parchment paper. Using your hands, shape the dough into walnut-size balls, then press them gently to flatten. Coat the cookies with sugar to make them crisp once baked. Space them evenly on the baking sheet and bake for 15 minutes until golden but still soft in the centre. Cool completely on the pan on a wire rack them from the oven and let cool in the pan. They keep well for a few days in a tin box. The sun is shining and with both the rhubarb patch and the hens exuberantly prolific at the moment it seems almost a necessity to adapt that most summery of puddings, the Pavlova, to the fruits of the Scottish springtime. The result is a Rhubarb Pavlova perfumed and gently flavoured with the musky sweetness of our Traditional Mead 14% and a tiny smidgen of Rhubarb Vodka Liqueur 20.5%. Preheat the oven to 100 degrees celsius and line a baking tray with non stick paper. Whisk the egg whites until stiff then add 200g sugar in 3 stages until all combined .Whisk in the Rhubarb Vodka. Spread the meringe mix onto the baking tray in a circle leaving a slightly higher rim around the edge and bake for 2 and a half hours. Then allow to cool and remove the baking paper before moving it to a serving plate. Lay the rhubarb in a shallow pan one layer thick and sprinkle over a little water and 50g sugar. Poach over a medium heat for 10 minutes then allow it to cool. Meanwhile whip the cream and 1 tbsp Traditional Mead together. Fold the yoghurt and remaining Mead into the cream then gently fold in half the rhubarb until it looks marbled. Spread the cream and rhubarb mixture onto the meringue base then top with the remaining rhubarb and its syrup. This deliciously grown-up ice-cream is wonderful served on top of freshly peeled orange segments. Mix together the ingredients adding the Gin sparingly. Check the taste and adjust the quantity of Seville Orange Gin accordingly. Chill the mixture for half an hour then churn in an ice cream maker. Freeze in an ice cream tub remembering to remove it from the freezer half an hour before serving to allow it to soften a little. I have always loved brown bread ice-cream, I think it's an inspired recipe that sounds so worthy, yet tastes so delicious. And now I have found a way to make it a bit more decadent. Whiz the bread to crumbs in a food processor then toast briefly in a dry frying pan turning them until they are golden brown. Melt the sugar in the water in a heavy pan, don't stir, just shake it occassionally until the sugar is evenly melted, then boil rapidly for 2 minutes. Remove from the heat and immediately stir in the breadcrumbs until the sugar syrup cools into crystals on the crumbs. Stir the Spiced Rum gently into the cream. Be prepared to taste until reaching the right flavour, not too much Spiced Rum, just enough to taste it in the cream. Now whip the cream mixture and once whipped gently fold in the crumb mixture. Freeze in an ice cream tub and remember to remove it from the freezer about half an hour before serving. Atholl Brose was traditionally drunk on Burns Night in Scotland and used to sort the men from the boys! This variation of the traditionally recipe retains the oatmeal to make a cranachan type pudding to be enjoyed by all. Whip the double cream until stiff, then gently stir in the toasted pinhead oatmeal and honey. 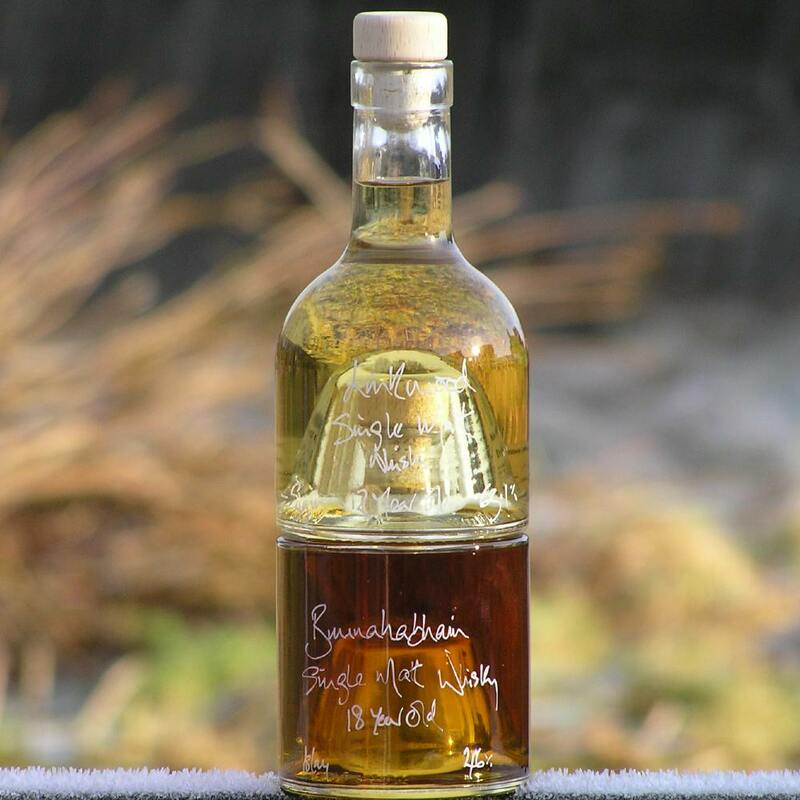 Chill and just before serving, mix in the Demijohn’s Finest Blended Scotch Whisky 40%. The name Atholl Brose is supposed to derive from the tale of the Duke of Atholl's capture of his enemy, the Earl of Ross, in 1475. The Duke was supposed to have filled a well, from which the Earl liked to drink, with this magical potion. Ross drank deeply and was captured. This delicious recipe will happily serve 4 hungry people. Pre-heat the oven to high (200C). Put the rhubarb into a roasting tin and sprinkle with the sugar. Roast for 20 minutes, turning over half way through. Allow to cool. Cut the cake into 1cm cubes and place in 4 large wine glasses. Sprinkle evenly with half the Ginger Wine. Top with the cooled rhubarb. Sprinkle with the remaining wine. Top with the custard and refigerate. Plop the yoghurt on top before serving. Enjoy! Our Festival Blackcurrant Ice-Cream is made with our deliciously rich Blackcurrant Gin Liqueur 20% which has been popular with our customers since we opened up shop in Edinburgh in 2004. No wonder then that it makes a very delicious ice-cream! Stew the blackcurrants with the sugar and 3 or 4 tbsps water until the fruit is soft. Puree them, then sieve out the seeds and allow to cool. Stir in the double cream and Blackcurrant Gin Liqueur. Chill the mixture in the fridge for 30 minutes then churn in an ice-cream maker for 20 to 30 minutes. Gooseberries are such a wonderful British fruit and this recipe is one of our nations favourites! Simmer the gooseberries with 2 dessert spoons of caster sugar until they are soft. Drain the juice off into a bowl and blend the gooseberries with 1 glass of Gooseberry Gin Liqueur. Add gooseberry gin, sugar and reserved cooking juice to taste until a soft pulp is achieved. Sieve the blended pulp to remove the seeds and fold into an equal quantity of ½ whipped cream and ½ greek yoghurt. Serve with very thin shortbread. This is fantastically simple, yet delicious recipe for a lunch or dinner party dessert. Peel the pears and add to a pan with the Elderberry and Port Liqueur. Simmer together for about 1 hour turning the pears occasionally, until the pears are soft. Remove the pears and reduce the liquid until it is syrupy. Pour it over the pears and serve with the good vanilla dairy ice-cream. This is a Zabaglione recipe of the most untraditional nature and is perfect for whizzing up for unexpected guests. Using a hand whisk beat the ice-cream and Somerset Pomona 20% together until the mixture is cold and fluffy but not frozen. Serve immediately in champagne saucers. This recipe can be used with just about all our hand made liqueurs. Have fun experimenting! This simple recipe is a great way of not only feeding a family but impressing a room full of dinner party guests. Line a flexible pudding bowl with one layer of bread slices. Simmer together any summer fruit, including raspberries, strawberries, redcurrants, brambles, a small number of blackcurrants, with sugar to taste. Once gently softened allow it to cool then sieve off some of the juice and replace it with Blackcurrant Gin Liqueur 20% (reserve the juice in case it is needed later). Pour the Blackcurrant Gin Liqueur laced fruit into the pudding bowl. Ensure that the juice soaks into the bread, colouring it all. Add the reserved juice and any additional Blackcurrant Gin as required. Top the pudding bowl with more bread slices, cover, and weight gently. This can be frozen until needed then turned out onto a serving dish, thawed and served with pouring cream. The Blackcurrant Gin Liqueur 20% used can be replaced with Raspberry Vodka Liqueur 22% or Morello Cherry Brandy Liqueur 17% as preferred. This delicious Highland Bread and Butter Pudding Recipe serves 3 with a good appetite and love for great whisky such as our Glen Moray 10 Year Old Single Malt Scotch Whisky! Butter the 6 slices of white bread, remove crusts and cut into quarters. Layer the bread in an shallow ovenproof dish sprinkling sultanas between the layers. Pour over 4 tbsps of Glen Moray 10 Year Old Single Malt Scotch Whisky. Heat 600ml milk but do not boil and mix together with 4 beaten eggs and 25g caster sugar. Gently pour this over the bread and butter layers and leave to stand for a few minutes. Sprinkle over a little brown sugar and bake at about 180 degrees for 35 minutes until the top is golden brown. This delicious recipe, using our much loved Raspberry Vodka 22%, serves 8 to 10 people and can be enjoyed by the whole family either at Christmas or another such large family gathering. The inspiration behind it comes from one of our most enthusiastic customers, Jackie Hancock. So thankyou Jackie for sharing your family secret with us all! Either one large glass bowl or two smaller bowls depending on your party. 1. Make a syrup with the water and 325g of the caster sugar by bringing them to the boil in a saucepan and boiling for 5 minutes. Take the pan off the heat, add the sliced lengthwise or crushed lemongrass and let it infuse for about half an hour. 2. Strain the syrup into a measuring jug, keeping the saucepan with the strained Lemongrass to one side. Take out about 150-200ml of the syrup and put it into a pan with the raspberries. Bring it to a rolling boil and let it thicken slightly, mashing the fruit to make a jam-like consistency. Let it cool a little and then dunk the trifle sponges in the raspberry mixture and arrange them in the bottom of your bowl. Add our Raspberry Vodka 22% and about 100ml of the lemongrass syrup depending on how much your sponges absorb, and reserve the rest. 3. Meanwhile, to make the custard, heat the single cream in the syrup pan with the Lemongrass until it is nearly BUT NOT boiling, take it off the heat and let it infuse for about 15 minutes. Whisk the yolks and the rest of the sugar together and pour the cream (without the Lemongrass) into the same bowl. Then whisk again and put the custard back on the heat in the cleaned-out pan. Stir or whisk until the custard thickens (MUST NOT BOIL) and then pour it over the trifle sponges. Let it cool. 4. Whip the double cream until thick but not stiff, and cover the custard layer. Use about 250ml of the remaining sugar syrup to make a caramel by heating it in a saucepan until it turns a golden-brown. Drizzle the caramelised sugar syrup over the layer of cream to decorate at the last minute, as it can sink into the cream if left. The caramel topping is optional, you can decorate the top with anything you like (get the children involved here!). - Apply to face quickly before anyone else realises how delicious it tastes!